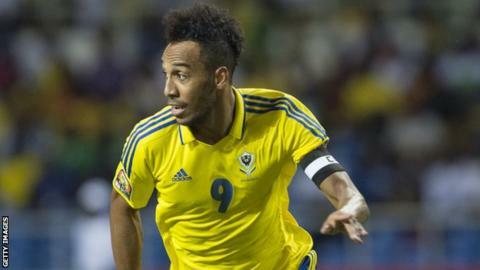 Gabon coach Daniel Cousin has included star striker Pierre-Emerick Aubameyang in his 23-man squad for their decisive final Africa Cup of Nations qualifier against Burundi. The Panthers must win in Bujumbura on 23 March to reach this year's finals in Egypt. A draw for Burundi will be enough to see them qualify for their first ever Nations Cup finals. Aubameyang, 29, missed Gabon's last two matches against South Sudan (a 1-0 victory) and Mali (a 1-0 defeat), despite originally being named in both squads. No official reason was given for the Arsenal striker's decision not to travel to Juba to face South Sudan, although reports suggested he was unhappy with suitability of the chartered plane, while he pulled out of the Mali game due to injury. Aubameyang, who has scored 17 goals in the English Premier League this season, including his strike against Manchester United on Sunday, has only featured in two of Gabon's five previous qualifiers. France-based midfielder Didier Ibrahim Ndong and striker Malick Evouna, who joined Portuguese side Santa Clara in January to get regular playing time, are both recalled. Defenders Bruno Ecuele-Manga, who has played in all 30 of Cardiff City's Premier League matches this season, and Lloyd Palun, of Cercle Brugge in Belgium, are among the regular names in the squad. Southampton midfielder Mario Lemina is left out after undergoing abdominal surgery in January. Three other players, Guelor Kanga Kaku, Cedric Ondo Biyoghe and Aaron Boupendza have all been put on the standby list.